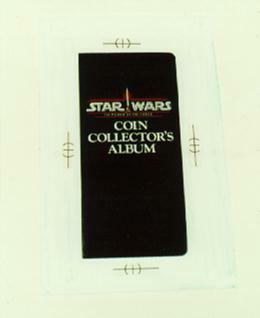 This is the original artwork for a Power of the Force Coin Collectors Album that was planned as a mail-in offer on 93-back POTF cards. The inside of the album holds the POTF coins. This mail-in offer never got off the ground, although various parts of it exist in prototype form such as the 63rd coin, which was a gold coin of two hands holding a lightsaber, and proofs for the 93 back cards. A prototype of this album was constructed that was probably created for photography purposes. The prototype matches the cover and inside sketches of this album artwork.